Ocean County Sheriff Michael Mastronardy, in Trenton on Monday afternoon, testified that legalizing recreational marijuana could cause a host of problems for law enforcement, prompting a tense, racially-charged response from a North Jersey legislator who is in favor of legalization. 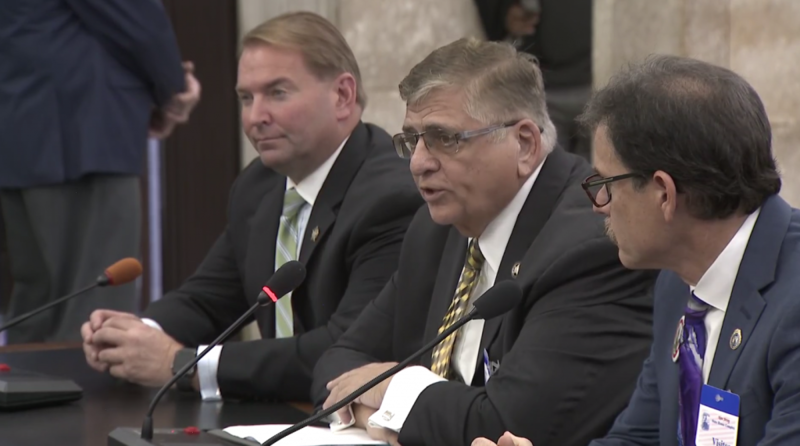 Mastronardy testified before a joint meeting of the state Senate and Assembly finance committees alongside Monmouth County Sheriff Shaun Golden and Sayreville Police Chief John Zebrowski. Mastronardy is currently serving as president of the Sheriff’s Association of New Jersey, a role which has exposed him to meetings with law enforcement officers in Colorado, the first state to legalize and regulate the sale of recreational marijuana. He said the potential use of marijuana combined with the state’s 2 percent expenditure cap could hamper efforts to recruit a more diverse array of law enforcement officers. Mastronardy also said expensive police canines that have received even more expensive training may need to be retired early and replaced because they have been trained to detect marijuana, which would become legal. The sheriff also took a shot at the overarching theme of legislators’ statements that legalizing marijuana is in the pursuit of a more equitable justice system. “This isn’t about social justice. It’s about money – we all know that,” he said. Under the proposed legislation, recreational marijuana sales would be taxed at 12 percent with the option for municipalities to collect a 2 percent revenue tax. Mastronardy’s concerns about whether enough officers are qualified to detect whether a driver is under the influence of marijuana while behind the wheel drew particular rebuke from state Sen. Nicholas P. Scutari, the sponsor of the primary legalization bill. The senator said the state’s current system of arbitrarily setting a .08 BAC level to determine whether a driver is intoxicated by alcohol is not perfect in and of itself. The trio of law enforcement officials said time should be taken to conduct additional studies on the effectiveness of enforcement against both impaired driving as well as whether legalization would reduce black market sales of cannabis. Assemblyman James Holley, a Union County Democrat, turned the issue to race and offered the strongest rebuke of the exchange. “This keeps you in business,” he told the two sheriffs and the chief. Scutari eventually stepped in and brought the conversation back to the issue of enforcement under legalization. He said one of the bills being considered by the committee provides funding to train new Drug Recognition Officers. The DREs, as they are known, receive specialized training and can testify as experts in court as to whether a person drove under the influence of a drug. “Under this bill, you would be eligible for training costs,” said Scutari. Golden, however, cast doubt upon whether the funds would ever make it to county and municipal police departments, whether they would cover the cost of purchasing and training new K9s and the ancillary costs of calling DREs out to traffic stops and accidents when they are not normally on duty. He said funds have “disappeared” in the past. “Is it going to be dedicated?” he asked. The question was not answered. The debate then continued, with 87 additional witnesses scheduled to speak before committee members were expected to vote on whether to advance the bill for a vote in the full chambers. The legislator who invited the group of law enforcement officials to attend the hearing disagreed. “For me, this is about the fact that we’re spending billions of dollars locking up nonviolent criminals, whereas I feel it is better to spend money on [stopping] violent criminals,” said Sen. Vin Gopal (D-Monmouth). A vote has yet to be taken as of 3 p.m. Monday.